Bao Yen Forest protection management Board is the first unit in Lao Cai province that implemented successfully sustainable forest management plan in 2016 – 2020 period. The activity of pilot establishment of Model “Co-management of forest protection with Benefit sharing mechanism” in Long Khanh Commune – Bao Yen district is the prior activity in the established plan. 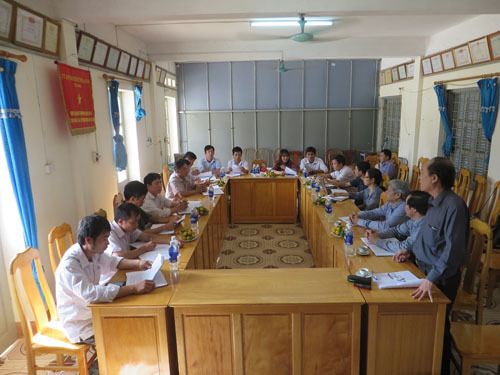 - Bao Yen FMB and Long Khanh CPC agreed to implement co-management of of forest protection with Benefit sharing mechanism, and conduct the consultation stages for commune level, village level and people to establish and complete the plan. - Expected indirect co-management through land and forest allocation with more than 100 ha of forest and forestry land that were reviewed and allocated to local authority. - It is expected to increase the productivity of specialties from crops and livestock. Long term supports for community development in the form of livelihood development foundation. Regulation will be established on the basis of synthesis of local existing funds. - Implementing the establishment plan and implementation of forest Co-management plan following the proposal and signed record. - Bao Yen FMB commits to send 02 officers to co-ordinate and support the establishment process of forest co-management model. - The parties agreed to finalize the plan in Nov, 2016, sending to related stakeholders for agreement, approval and implementation.